Athletic Movers is completely dedicated to serve you better! Our company was rated one of the best in Brooklyn movers last year. Our company was established in 1995 with one single goal: to make moving easy and affordable for anybody who needs it. For over 20 years, we were able to accomplish it with thousands of clients in Brooklyn, New York City, Bronx, Queens, Long Island, and Staten Island. The company is privately owned and offers very professional movers as well as a well-equipped truck fleet. We are available for customers in New York. We are prompt and accurate. Our prices are quite affordable and competitive. We have many years serving our loyal customers. We offer certified moving consultants to help plan your home relocation and estimate the related cost. We have experienced, professional managers and supervisors to assist you throughout the entire relocation. Employees of Athletic Movers are well trained in furniture handling techniques and safe-driving practices. Since the packing is crucial to a successful move, our packers are trained in using the right packing materials for each situation. To find out more about this or any of our other services, or to arrange for your movers today, complete our online contact form or speak with our friendly team of experts on 1-718-339-8830 today. We’ll be more than happy to help with any inquiries and will arrange a removal for you that is efficient and competitively priced. 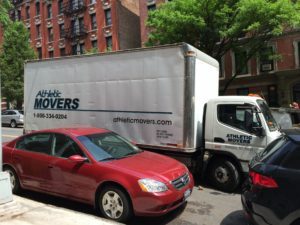 Check our our commercial and residential Brooklyn Movers, also serving the NYC area, with Athletic Movers Inc: the best combination of resources and experience in New York. You will receive great service.